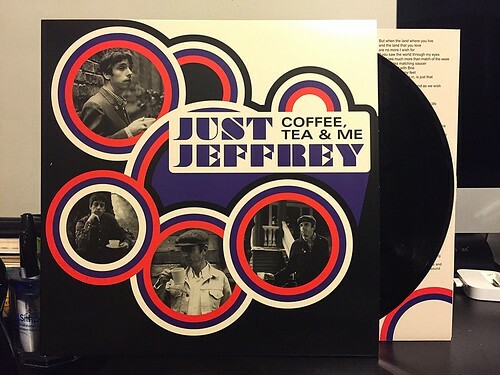 The man behind this Just Jeffrey album is Jeffrey McCloy, familiar to me (and maybe to you) from his work in Tranzmitors. While McCloy recruited some musicians to help flesh out the tracks on this album, this is essentially his solo album and very much plays like one. It's not unusual for someone who is used to the dynamics of being in a band to let loose a little when they start up a new project. You can see lots of examples of this going well, but you'll find even more examples of this not working out at all (hi Eric Bachmann!). Just Jeffrey kind of runs the gamut over the course of this record. I really enjoy the more upbeat, mod leaning songs on Coffee Tea & Me like "Hello Eleanor" and "Disposable Culture". He's tapping in to a catchiness that always gets my attention. Less successful are the handful of songs that are sparser and more introspective. There are times where I'm very much reminded of bands like So Cow and The 'Tone over the course of Coffee Tea & Me, but there are some times where it just sounds like some dude dicking around by himself. Those are the songs that I don't get as much mileage out of. Still, at eighteen songs there is a lot to like on this record. A little editing probably could have made it tighter, but it's worth checking out regardless.